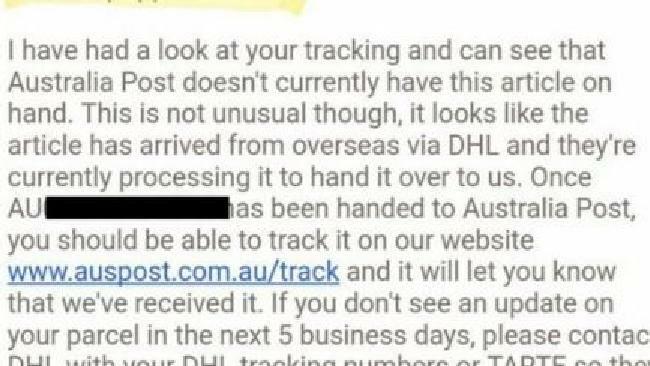 An email response to a customer from Australia Post has gone viral. 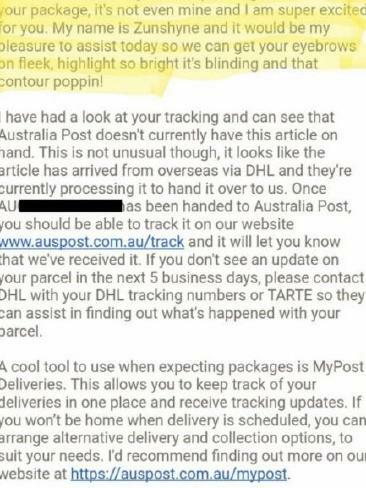 WHEN Canberra woman Cassandra Noack contacted Australia Post to check how her makeup shipment from Tarte Cosmetics was tracking from the US, she probably didn't expect this response. The enthusiastic reply that Noack received from Australia Post employee Zunshyne was something out of a makeup lover's dream, quickly going viral after being shared in a Facebook group. Zunshyne starts off the uplifting email by letting Noack know that even she is excited for her to receive her package of makeup goodies. "I can understand that you'd be quite eager to receive your package, it's not even mine and I am super excited for you," she said. "My name is Zunshyne and it would be my pleasure to assist today so we can get your eyebrows on fleek, highlight so bright it's blinding and that contour poppin'." It is always comforting to know that your postal service cares as much about your precious cargo as you do and Zunshyne went above and beyond to make sure a fellow makeup enthusiast was satisfied with their service. After going into detail about how to track the parcel and what to do if she encounters any issues, Zunshyne signed off the email in the most perfect way possible, not that we expected anything less from this customer care goddess. "May you slay every day," Zunshyne wrote at the end of her reply. Australia Post spokesperson, Michelle Skehan, told news.com.au that Zunshyne was "ecstatic" when she found out about the positive feedback her response was getting. "Zunshyne is one of our social media superstars and she is part a team that works 24/7 answering customer inquiries and helping to track important online shopping parcels," Skehan said. Noack told Mamamia that she was so surprised and delighted by the message that she "nearly fell off [her] chair" when she first read it. "I could not stop laughing after reading it and knew that the members of the makeup social would appreciate it, so I shared it straight away." In fact, Noack was so happy with the response that she gave feedback to Australia Post instructing them to give Zunshyne a "high-five, a raise, and every Friday off from here on in". 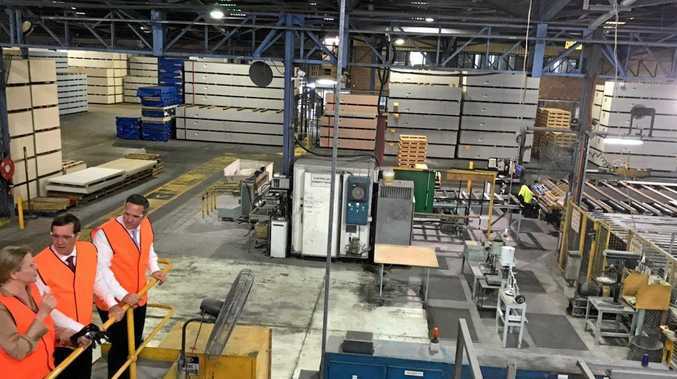 Skehan said that they have taken Noack's advice on board, having already given the exceptional employee a much deserved high-five. "We are pleased to advise that Zunshyne has definitely received a high-five and will also receive a Sephora voucher so she can indulge in her passion for cosmetics, and to thank her for her ongoing amazing work," she said. Not only did Noack's parcel arrive the very next day but she had the pleasure of bonding with Zunshyne over their mutual love for makeup.